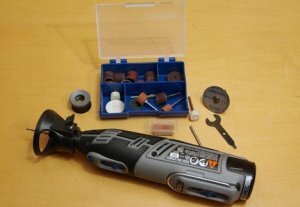 Every time Dremel comes out with a new rotary tool I get that warm fuzzy feeling inside. I don't know why, maybe because it is one of those tools that you know can always get you out of a jam. That is, if you remember to have it on the job when you need it. This is also the reason I love the fact that it is cordless, no cords means it is practically setup right out of the case. 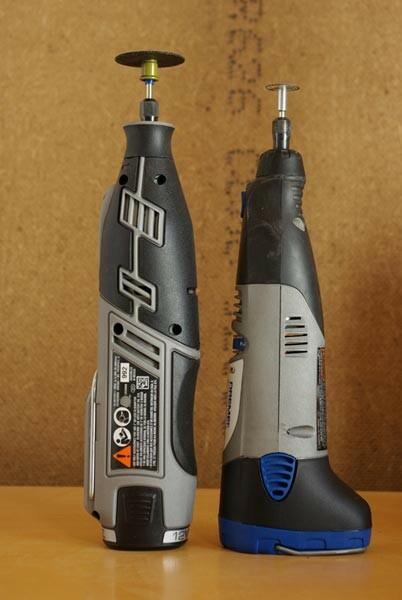 The 8200 is Dremel's first Rotary tool that is compatible with all Dremel accessories and attachments, so the gap between cordless and corded is getting even smaller. 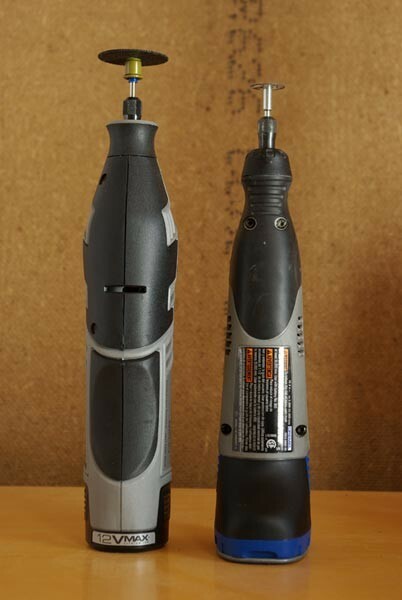 In comparison to an older cordless Dremel I have (model 800), the 8200 is a bit longer in length and you can also see that it does not taper towards the top. This might make it a little harder to handle for people with small hands, but for me the difference was hardly noticeable. The balance for the 8200 also seemed to be much better over the previous version; this is probably because of the more compact battery used in the 8200 and the lack of taper. You will notice both models are variable speed and both include easy to read battery indicator lights. It is always handy to know when you are getting close to a dead battery, so I am a fan of the lights. 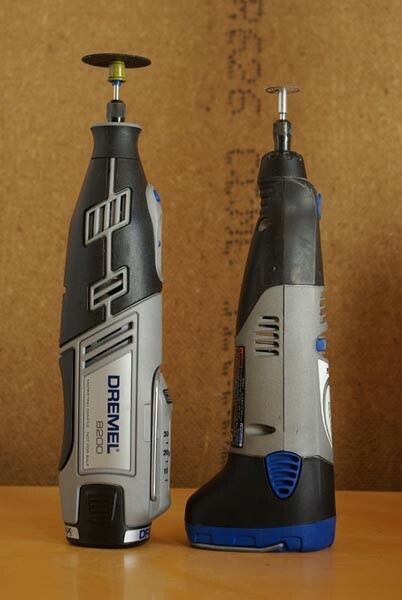 Dremel also chose to separate the on/off switch from the variable speed switch with the new 8200; this is a feature that I like, but was something I had to get used to. Because of the change, you can keep your speed set for a particular project even if you need to stop and start the tool again. The switch controls a variable speed range of 5,000 to 30,000 RPMs. I tested the 8200 by doing a bit of grinding, polishing, cutting, and routing, trying to get a true test of how it feels and how it operates. I spent a good while routing some wood trying to see if I could get the 8200 overheated, a hot tool is a bad tool, but the 8200 stayed cool during the entire operation. It felt comfortable during one hand operation and felt 10x better in two handed operation over the Model 800. The body of the tool is coated in rubber, which is great for people like me that are doomed with sweaty hands and need the extra non slip grip. The thing that bothered me the most about the tool was the 1-hour charger. The 8200 uses a 12-volt lithium-ion battery that is almost identical to the Bosch 12-volt batteries in appearance, and is 100% identical in specs. 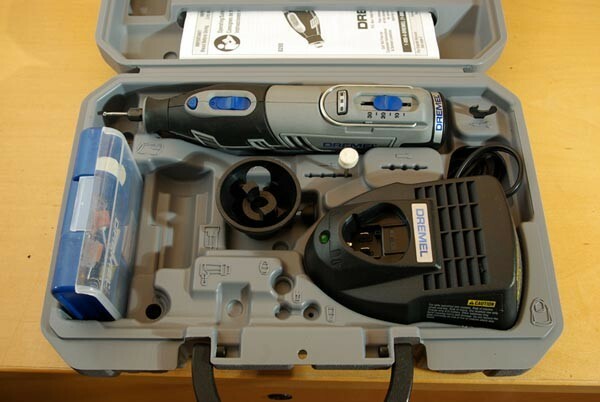 The Dremel comes with a 1-hour charger, but the Bosch uses a 30 minute charger. The Dremel battery will even fit in a Bosch charger, though I did not test to see if it would charge. So why the skimp on the charger? 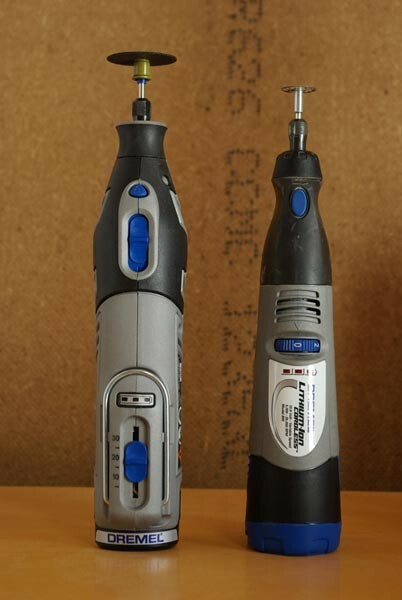 FYI both Dremel and Bosch are owned by the same company. If they both used the same battery and the same charger, it would be one less thing to carry. There was a place for everything in the 8200 case, and for the most part I am happy with it. There are a few places where small bits and accessories can get trapped and this is something I would like Dremel to fix, but I doubt it will happen. I have heard of people getting around this problem with past Dremel cases, by filling these gaps with a little expanding foam. So all in all I am happy with the performance and quality of the tool, it both felt and performed like a well built tool. Please note that Dremel sent me over a pre-production model so I could get my testing started without having to wait for the release date. I was warned that there might be some imperfections in appearance and performance. I didn't notice any problems with appearance or performance during my testing, so if this is what a pre-production tool looks like, you should be happy with the final version. You can pick up the 8200 in a kit with one battery and a verity of accessories to get you started, or pick up a kit that includes 2 batteries, right angle attachment, and starter accessories. Online price is between $100 - $150.